An artery is a blood vessel that carries blood away from the heart to other parts of the body. Almost all arteries carry blood with a lot of oxygen in it. The only arteries that do not carry oxygen-rich blood are the pulmonary artery, and (in a fetus) the umbilical artery. Every artery has three layers. The outer layer is a thick covering made of stretchy tissue. The middle layer is made of muscle, so the artery can get wider or get smaller when the body needs it to. The inner lining is made of the same cells that line the heart. Arteries are deep under the skin. They do not have valves to prevent blood from flowing backwards. Instead, every time the heart beats, the arteries stretch out so the blood has room to go through. Once the walls have completely stretched out, the muscles in the arteries make them shrink back to their normal size. This pushes the blood through. Arteries split down into small vessels called arterioles. The body's major arteries. Notice how they all branch off of the aorta. The aorta is the main artery in the human body. It starts in the left ventricle of the heart, which is full of blood that just picked up oxygen in the lungs. (This is called oxygenated blood - meaning it has a lot of oxygen in it.) The left ventricle pumps this oxygen-rich blood out through the aorta. The aorta brings this blood to every organ in the body. The aorta runs all the way from the heart to the bottom of the abdomen. Along the way, smaller arteries split off the aorta, like branches on a tree, to bring blood to different parts of the body. The aorta finally ends by splitting off into the two arteries that bring blood to the legs. The body uses the oxygen carried in the other arteries to make energy. 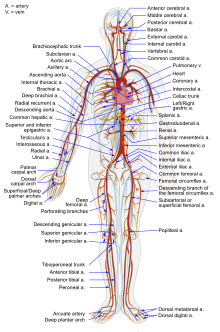 The blood in these arteries becomes deoxygenated - it does not have much oxygen left in it. This blood then travels through capillaries to get from the arteries to the veins. The veins' job is to carry the deoxygenated blood back to the right side of the heart. The pulmonary artery carries this blood from the heart's right ventricle to the lungs. In the lungs, the blood can pick up more oxygen. After picking up more oxygen, the blood travels back to the left side of the heart and is pumped out to the body by the aorta. This cycle continues, over and over again. Because the heart pumps blood right into the arteries, the arteries are under a lot of pressure. Unlike the veins, the arteries are always stretching and then squeezing to push blood through them to the body. Because of this, an arterial bleed - bleeding from an artery - can be a medical emergency, especially if the artery is big. Arterial bleeding can happen very quickly. For example, if a person's femoral artery is cut, they can bleed to death. If an artery in the brain starts bleeding, the bleeding can cause a stroke. When a person has arteriosclerosis, the walls of their arteries get harder, stiffer, and less stretchy. This makes it more difficult for blood and oxygen to get through the arteries to the body's important organs. One type of arteriosclerosis is atherosclerosis. Atherosclerosis is a disease where the arteries get narrower because they are clogged up with things like cholesterol and fat. Like a clog in sink pipes makes it harder for water to get through the pipes, clogs in arteries make it more difficult for blood to get through. This makes the heart have to work harder to push blood through the arteries. Atherosclerosis is a big risk factor for high blood pressure and heart disease. When atherosclerosis happens in the coronary arteries, it can cause coronary heart disease. If these arteries get too clogged, the heart will not get the blood and oxygen it needs to survive. This can cause angina, a heart attack, heart failure, or even sudden death. 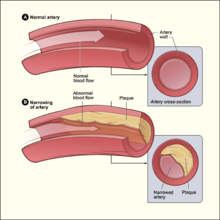 When atherosclerosis happens in one of the arteries in the brain, it can cause a stroke. An aneurysm is a bulge in the wall of an artery. It is like a little balloon, filled with blood, coming off the artery. As the aneurysm gets bigger, it is more likely to break. If the aneurysm breaks ("ruptures"), the artery will start bleeding. If the artery is big, a person could bleed to death. Also, if an artery is bleeding, blood cannot get through it. The part of the body that the artery is supposed to feed will not get the blood and oxygen it needs. A ruptured aneurysm is a medical emergency. ↑ 1.0 1.1 1.2 "Artery: Anatomy". Britannica.com. Encyclopædia Britannica. January 14, 2016. Retrieved January 29, 2016. ↑ 2.0 2.1 2.2 2.3 "Anatomy of the Aorta and Heart". Cedars-Sinai Heart Institute – Aortic Program. Cedars-Sinai. 2016. Retrieved January 29, 2016. ↑ "U.S. Navy Standard First Aid Manual, Chapter 3: Bleeding". United States Navy. Retrieved January 29, 2016. ↑ 5.0 5.1 5.2 Mendis, Shanthi; Puska, Pekka; Norrving, Bo (2011). Global atlas on cardiovascular disease prevention and control (PDF) (1st ed.). Geneva: The World Health Organization, the World Heart Federation, and the World Stroke Organization. pp. 3–18. ISBN 9789241564373. ↑ 6.0 6.1 DeBakey, Michael E. (September 12, 2014). "Aneurysm: Pathology". Britannica.com. Encyclopædia Britannica. Retrieved January 29, 2016. This page was last changed on 3 April 2019, at 09:04.